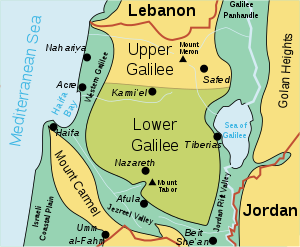 Galilee (Ebreu: הגליל‎‎, transleeteration HaGalil); Arabic: الجليل‎, translit. al-Jalīl) is a region in northren Israel. The term Galilee tradeetionally refers tae the moontainous pairt an dividit intae Upper Galilee (Ebreu: גליל עליון‎‎ Galil Elyon) an Lawer Galilee (Ebreu: גליל תחתון‎‎ Galil Tahton). This page wis last eeditit on 10 Apryle 2017, at 20:35.